Pimp My Viz 2: Electric Boogaloo....the Follow-up! I had a blast bringing back my weird point-of-view on making dashboards a little more fun to #Data15. Last year, I focused more on custom design and making things look as little like Tableau as possible. This year, I went a little more in the direction of doing some calculations and interactions that are a little more advanced. Let's take a look at what I did! I figured out what color red Buzzfeed uses using the Colorzilla Chrome App. I then applied this color all over the dashboard. The charts themselves are pretty simple and didn't need a lot of different colors. That's actually great because it allows us to really solidify this theme with the BuzzFeed red. I made a banner to try to emulate the header on the BuzzFeed website. I poked around on FontSquirrel for a while until I found a font that was a close approximation. FontSquirrel is great because every font on there is free to download and licensed for commercial use. I cleaned up the bar chart by hiding the header for titles and instead moving the title onto label. I like doing this a lot to bar charts because it allows you to use the maximum amount of space showing the data and you get to have long labels without them getting cut-off. First: it was already in the viz before I started pimping it, but you'll notice I have a parameter in the corner to switch between the different kinds of reactions. If you don't already know how to use a parameter to switch between measures, here's a helpful walk through from Nelson Davis. It's definitely a trick every viz pimp should know! Next to the parameter chooser, I put little emojis that reflect what the reactions are. Why emojis? Because it's BuzzFeed and I'm a millennial and I don't know how else to communicate emotions. Making the emojis had two parts. First, you have to create a folder of custom shapes. Then, you have to make a Case calculation, like what you make for switching variables with a parameter, but this time, you just say "WHEN Broken Heart THEN 'Broken Heart'" as a way to get all the different options into one variable. The annoying thing is that only one parameter can be selected at a time, so you'll have to go through and select every option in the parameter to change the emoji for it. Under the BuzzFeed header, we have a little fake article headline written in the style of a BuzzFeed listicle. This took a couple steps. I wanted to title to be based on whatever number in the histogram had the most reactions. So first I created a Rank calculation based on my parameter measure. I made a table that had the measure [Number in Title] along rows and displayed labels. I set up the labels to say " articles that prove that item listicles elict the most "" reactions"
I hid the header of [Number in Title]. Finally, I needed to hid everything but the number 1 ranked number. I used a Lookup calculation based on rank: "Lookup([Rank],0" to filter out anything that was ranked higher than zero. Now the only thing left is the number one ranked [Number in Title] and it dynamically changes with the parameter. Figure out how many coins you'll need by determining how much one coin stands for. I went for each coin representing $19, as that was pretty much steadily the price of gold up until the 1960's. I made a calculation called [Coin Count] which is quite simply the [Close] measure (closing price of gold) divided by 19. Next, figure out what is the maximum number of coins you'll need by visualizing the [Coin Count] measure. The tallest stack in my dataset was 2012, with 88 coins. This part is tedious, so I recommend you do what I did and rewatch old episodes of "Gilmore Girls" while doing this part (especially in preparation for NEW EPISODES ON NETFLIX!!). We need to create a calculation for every possible coin in the stack, meaning 88 calculations. These calcs look something like this: "if sum([Coin Count]) > 1 then 1 end". Repeat 88 times. This is what draws each of our coins on our chart. Now we put [Measure Values] on Rows with [Year] on Columns and make sure that all 88 of our coin calcs are in the Measure Values window. Lastly, we need a little flat coin custom shape. I found an image of coins stacked on top of each other on Google (remember, I'm not an artist...just a Google images curator) and cut out the top coin shape using the scissors tool in GIMP. Some small design stuff: I changed the colors of the bubbles to reflect the Gold theme and added Scrooge McDuck diving into the piles of coins. I pointed out in my session, that although he's totally useless here, using images with transparent parts can be used to do some cool things, for example this dashboard by Ancestry.com which uses a transparent house layered on top of a bar chart to make it look like the house is filling up with data. Lastly, what kind of dashboard about gold doesn't have BLING?!?! I created some glitter text using this glitter text generator. I then hosted the images on Imgur instead of linking directly to the images created by the generator. Why? Because Imgur supports HTTPS, which is crucial if you want your URLs to actually appear on the Tableau Public webpage. I added the glitter text gifs as web objects instead of as pictures because animated GIFs aren't supported as images. Besides making this viz look ridiculous, the gifs don't really add that much. But I thought of a borderline useful use-case for them! OMG! A useful application for gifs?!?!?! You've gotta be kitten me! Create the gif. I used Camtasia, which I have for recording training videos, but that's a pretty hefty piece of software. There's plenty of free tools to create screen capture GIFs, so pick whichever one works best for you. Host the gif online (again, Imgure FTW!) and embed it on your dashboard as a web object. Float the sheet that you are animating on top of the web object. What we are basically doing is a variation on this trick I wrote about last year, to leave your viewers with a message when filters make your vizzes disappear. Last, we need to create a button to make the viz disappear and show the animated gif behind it. To do this, I created a calculation that equals "Null" for everything. I made a button out of it by creating a sheet, putting the calc on text, and setting a square shape in the background. I edited the text label to say "See/Stop Animation". I added to my dashboard with a dashboard action that effects the scatter plot on click and where clearing the filter excludes everything. This is what makes the chart disappear and the gif behind it reveal itself. Colors. Don't be satisfied with the default Tableau blue! 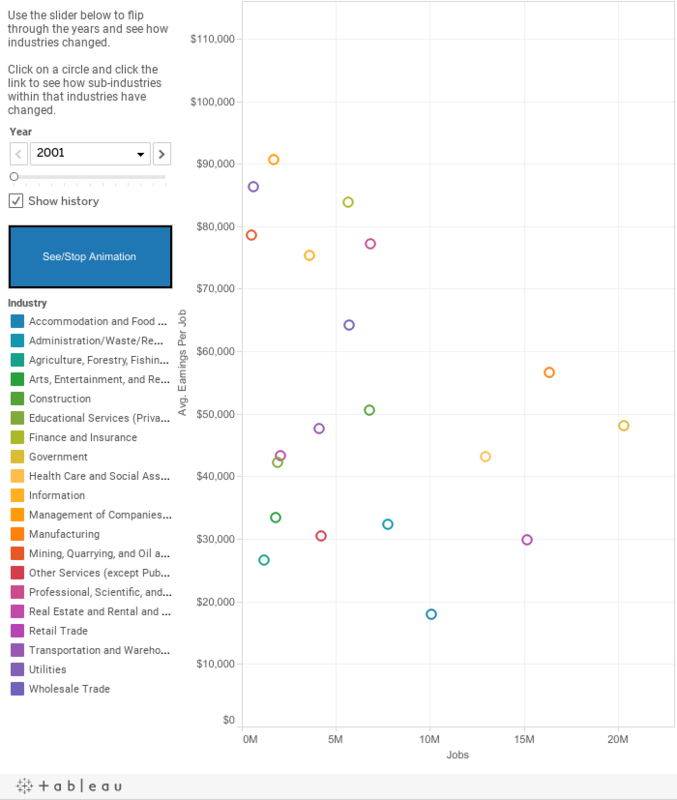 I like using sites like Colourlovers to choose color palettes that aren't built into Tableau. I also like that they limit their palettes to 5 colors, which makes you really think about how you are using your color. Ryan Sleeper wrote a pretty fantastic blog post about color a couple years ago that is still a great resource. Marks Card Magic. Along with changing the color, there's plenty you can do with the Marks card to pimp out your viz a bit. Make your bars fatter! Add labels! 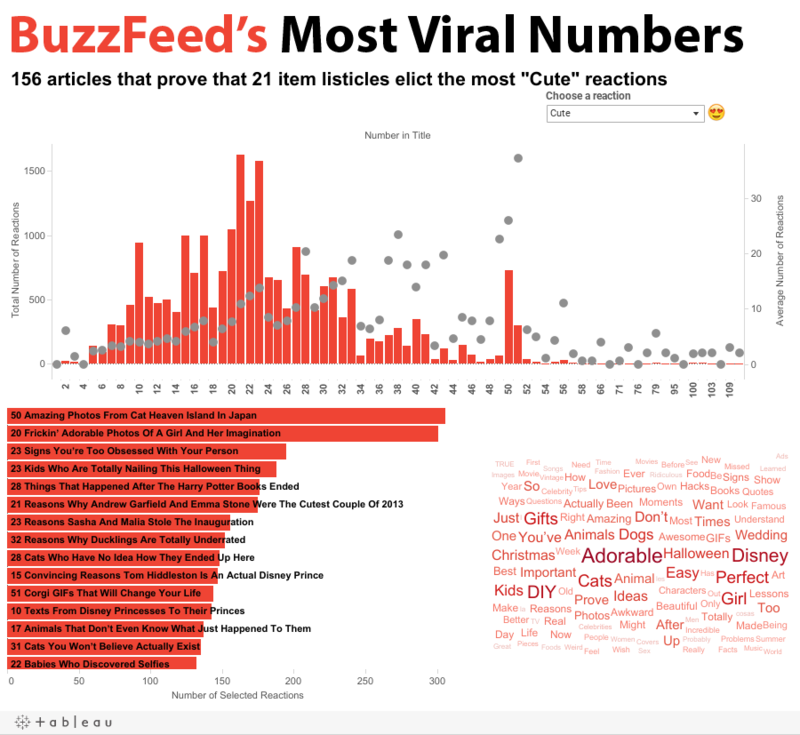 The stuff I did to the bars in the BuzzFeed viz above is a good example of how simple changes on the marks card can make a pretty strong impact when it comes to making a viz look custom. Add a banner. A good title for your viz is a MUST. And you might as well take that opportunity to make a banner. Banners are great because you can communicate what the theme of your dashboard is and set the tone for what people are about to see. My typical banner strategy is to find an image related to what the dashboard is about, crop it, blur it, and add the title in a custom font. I often use Adobe Illustrator for this, but a few people in the viz design community have confessed to me they just use Powerpoint for this and it gets the job done. For a web based solution where you can create some REALLY gorgeous graphics for your vizzes, I highly recommend Canva. It's a web based drag-and-drop design tool that's super intuitive and has stock images built right in for you to use. I actually use it all the time for designing gig posters for my band and am just now starting to use it for viz work. But I have a feeling it's going to be my go-to from now on. Clean up the tooltips. SWEET MOTHER OF GOD JUST CLEAN UP YOUR TOOLTIPS, OK?!?! You should NEVER EVER EVER publish a viz with default tooltips. I assure you, they look like unreadable crap 100% of the time. In my session, I said that if you don't clean up your tooltips, little fairies will fly into your bedroom at night and punch you in the face. I'm not joking. Although, the little fairy might be me in a tutu and fair wings, but I assure you, you'll get punched. In the face. You don't want that do you? So just clean up your tooltips, ok? Thoughtful Interaction. A dashboard without interaction is like pizza without cheese.... an ABOMINATION. Think through how people might want to interact with the data you are presenting them and try to make the order of operations make sense. Make the order that you click things go from left-to-right and top-to-bottom since people in the Western world read that way. Have a friend look at your dashboard and just watch what they try to click on and make those the areas where you put your interaction. 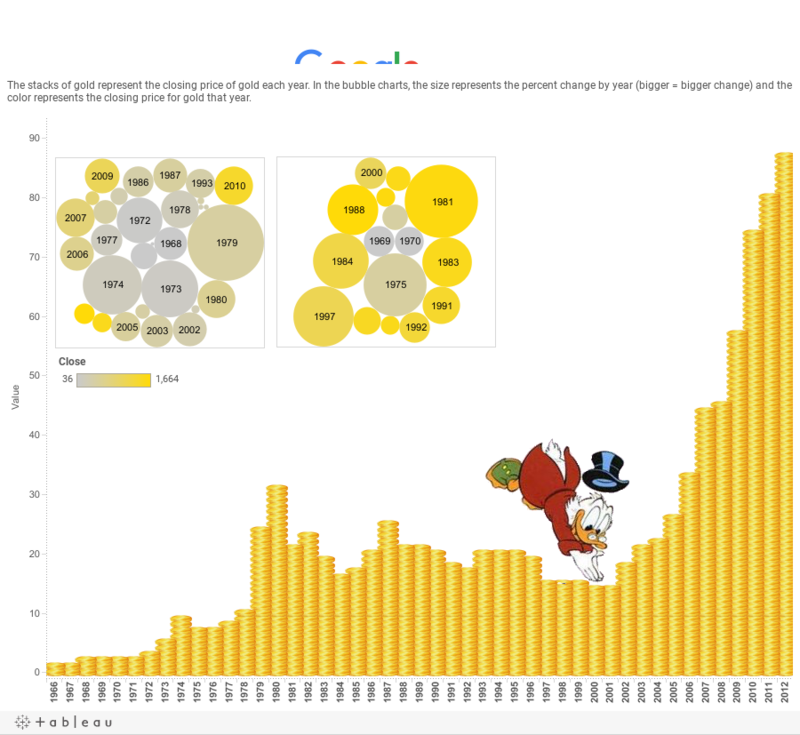 The more people play with your viz, the more they'll remember it! Finally, let's wrap this up with some of my favorite tweets about my session. #boogalooviz #data15 I agree with@jeweloree. Update your tooltips or little fairies will come punch you in the face. Need more pimping? You can also watch the original Pimp My Viz session from TC14 in Seattle and read the followup! 'Vertical Spas vary in design and some, such as Moen's unit, work with standard plumbing.